Now here is when things started really getting messy. Basically at this point in the makeover we lived in a sea of mud, dirt, and/or sand. And it lasted 3 long months because of rain delays. In the photo above the wood wall has been removed and it is now curving instead of at a 90 degree angle. The first row of rocks are going down. Also to the left, the dirt has been cut out for future stairs. If you look real close in the background you can see my plumber working to reconfigure the location of the water faucet (and you can see my portable greenhouse kind of falling down). Here's another shot of the beginning of the rock wall. 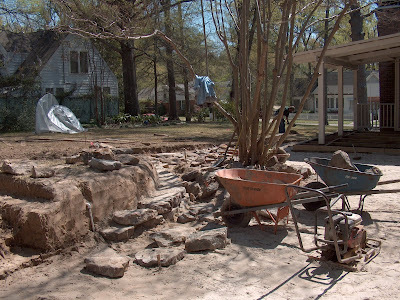 About 1/3rd of the wall went up and then the principle wall builder quit to work in the oil fields of east Texas! So the guy managing the landscaping crew built all the rest of it (and did a fine job). 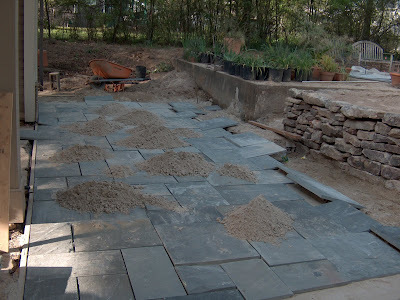 Below is the finished rock wall and the bluestone starting to go down for the patio and walkway. 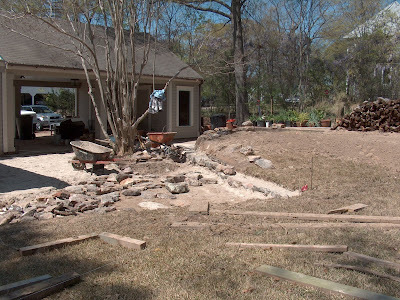 Above the wall new topsoil has been spread and shaped in order to give a softer, more rounded appearance to the lawn. The stairs up to the lawn are still unfinished in this picture. The landscaper tried to create stairs with the bluestone and some of the rocks but it looked too fussy. Several months later I was able to get my trusty carpenters to build the stairs out of wood and gravel (my landscape architect friend's idea). You might be wondering about that large wall to the left of the future stairs. That's a large concrete pad for a garage that was never built. It backs up to a former alley so I guess former owners planned to drive through the alley to the garage. Note all the plants in black pots on the pad that I had dug up and prayed would survive until I could plant them again. Most of them are daylilies and bearded irises. In my next blog I'll show and talk about the flower boxes and the real beginnings of my garden - the plants! Hi Jean, both this post and the last one are whetting my appetite to see what comes next! The bluestone is just gorgeous, you must love it. Everything always seems to cost twice as much and take twice as long we have found. I love the wall and think the guy who finished it did a great job. How exciting. And I loved the ideas your friend came up with for the grand plan. I also don't like plants right up against the house. Can't wait to see what comes next!